Depending on the product type, the impression schedule may be either standard or auction based. Select Create impression schedule in the menu to the left (towards the bottom). Enable the Autocontinue option to continue displaying ads if the target number of impressions was not attained by the end of the planned period. If autocontinue is not enabled, ads will stop displaying after the period indicated has ended. For more information, see What is schedule autocontinue? Transfer the unused impressions to another time period. Transfer the money paid for those impressions to another ad campaign. Refund the money for those impressions. If you chose the “Dynamic” purchasing method, enter the number of impressions for the set period. Restriction. The number of impressions in the schedule should exceed or equal the minimum number of impressions. If you selected a paid DMP segment (Yandex.Audience segments) as a targeting condition, the cost will be factored into your planned budget. Budget — you enter your budget and get the maximum possible number of impressions without going over your budget. Minimum CPM — you enter the number of impressions you want and they are displayed for the minimum possible price. Average CPM — you enter the number of impressions you want and the maximum average CPM and your impressions will display over the shortest possible time period. Fixed CPM — you enter your budget and current CPM and get impressions for that price without going over your budget. Enter the impression dates and other parameters for the strategy you selected. Click Show forecast to calculate the forecasted CPM and a general schedule forecast. If the forecast is negative, try adjusting the settings (for more information, see the What can I do to get a positive schedule forecast?) section. The forecast is calculated for the current time and may change at any moment. You can find out more about forecasts in the Auction forecast section. For more information about strategies, see the What auction strategies are available? section. Early bird is an ad sales method where the cost of impressions is determined by the reservation order. The first advertiser to reserve a line and send it for confirmation gets the minimum price. The cost to serve impressions for lines that reserve traffic later for the same period and with the same targeting settings increases in proportion to the share of traffic that is reserved. That's why an advertiser that reserves traffic earlier will get a lower price. For more information, see How is pricing determined with the “Early bird” method? Enter line dates and the number of impressions. Click Show forecast to calculate the forecasted CPM. If you are not satisfied with the forecasted price, try changing the line dates. CPM forecasts are calculated for the current time and may change when you actually make the reservation. For more information about forecasts, see the Can forecasted CPM differ from actual CPM for reservations? section. To temporarily reserve traffic, click Save and book. This way, the price will be calculated and fixed at the time when you place your reservation. If you don't send your line for confirmation during the stated time period, your reservation will be canceled. If you only want to save the schedule parameters (as a draft), click Save and the forecasted price will not be fixed. There can only be one auction schedule (regardless of whether the “Early bird” option is in use). If you need to set up several schedules, create a separate line for each of them. Go to the Lines tab of the ad campaign. 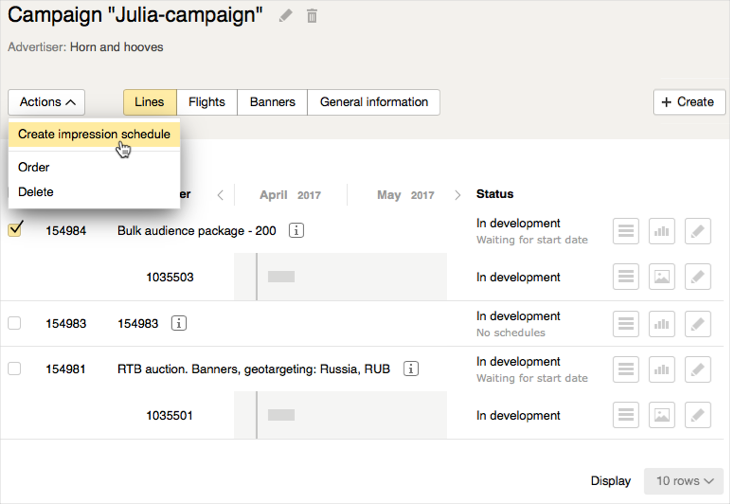 Select the line and go to Actions → Create impression schedule.